In the latest episode of 21st November 2018, Yeh Hai Mohabbatein, Ishita exposes to Sudha in front of all. Sudha gets arrested by police. 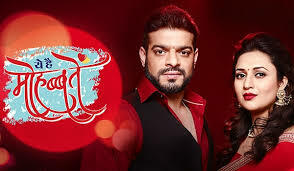 The police inspector becomes too confused about whom to trust for the truth, Raman family or Sudha. Raman asks that the inspector to check other whether Sudha has any proof against his daughters. Sudha said to her that she has a medical report as a proof against Raman’s daughters. The inspector asks her that why she did not come to the police station if she had medical reports. Sudha said that she was very confused and was not able to understand that what to do, so she went to the NGO for the help. Police inspector asks her to show the medical reports. She shows to him the medical reports. Police inspector checks these very carefully. He asks that there is a real paper or a fake. Ishita notices that the medical reports are from the Sarvodaya Hospital. She said that Sudha is the owner of the hospital and she does such fraudulent activities of fake reports regularly like the same as Raman’s fake report. Sudha shos to her that the wound on her palm. Sudha tries to touch her palm. She was trying to portray that she is getting hurt when Ishita touches it. After so many times IShita takes out the sticker of fake injury on Sudha’ palm. Due to this Sudha gets exposed in front of all. Alia said to her that Sudha is the fake lady so there is no need to believe on her. She shows that the sticker to all. The police inspector asks to Ishita that how she came to know about Sudha’s fake injury.